Not to be confused with Samuel Barrington. Samuel Kofi Barrington (born October 5, 1990) is an American football linebacker for the New Orleans Saints of the National Football League (NFL). He played college football at South Florida. Barrington was drafted by the Green Bay Packers in the seventh round of the 2013 NFL Draft. He has also played for the Kansas City Chiefs. Barrington attended Terry Parker High School in Jacksonville, Florida, where he started all four years and played on both sides of the ball. He logged 1,188 yards rushing and 17 touchdowns on 108 carries as a senior, and also added more than 109 tackles, five sacks, one interception, two forced fumbles, two fumble recoveries and six pass break-ups while playing multiple linebacker positions. He recorded 104 tackles, including 74 solo stops, three sacks and three forced fumbles during his junior season. Barrington was selected in the seventh round (232nd overall) by the Green Bay Packers in the 2013 NFL Draft. On May 10, 2013, he signed a contract with the Packers. Barrington was placed on injured reserve on November 5, 2013. He suffered a foot injury against the Chicago Bears in Week 1. Barrington was placed on injured reserve two days later. He was the Packers' nominee for the Walter Payton NFL Man of the Year Award in 2015. On September 3, 2016, Barrington was released by the Packers during final team cuts. On September 4, 2016, Barrington was claimed off waivers by the Kansas City Chiefs. He was released by the Chiefs on November 1, 2016. On November 9, 2016, Barrington was signed by the New Orleans Saints. Barrington is a cousin of Packers nose tackle Letroy Guion. ↑ "NFL Events: Combine Player Profiles - Sam Barrington". NFL.com. Retrieved August 10, 2016. ↑ "Sam Barrington - South Florida, ILB : 2013 NFL Draft Scout Player Profile". NFLDraftScout.com. Retrieved August 10, 2016. ↑ "Sam Barrington Draft Profile". NFL.com. Retrieved August 10, 2016. ↑ "Packers sign nine draft choices, nine undrafted free agents". Packers.com. May 10, 2013. Retrieved August 23, 2016. ↑ "Sherrod activated; Finley, Barrington to I.R.". Packers.com. November 5, 2013. Retrieved November 2, 2016. ↑ Demovsky, Rob (September 15, 2015). "Packers LB Sam Barrington goes on IR after injuring foot Sunday". ESPN.com. Retrieved September 9, 2016. ↑ "Packers announce transaction". Packers.com. September 15, 2015. Retrieved September 9, 2016. ↑ "Sam Barrington nominated for Walter Payton NFL Man of the Year". Packers.com. December 2, 2015. Retrieved August 10, 2016. ↑ "Packers keep six undrafted rookies, including QB Joe Callahan". Packers.com. September 3, 2016. Retrieved November 2, 2016. ↑ "Chiefs announce additional roster moves". Chiefs.com. September 4, 2016. Retrieved September 9, 2016. ↑ Paylor, Terez (November 1, 2016). "Chiefs release Sam Barrington, Sio Moore". KansasCity.com. Retrieved November 2, 2016. 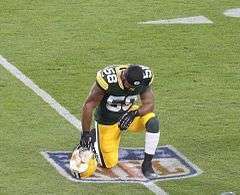 ↑ "Green Bay Packers: Sam Barrington". Packers.com. Retrieved September 9, 2016.